"unless until lake is filled with water 365 days, i do not think we are achieved everything. yes, i appreciate all effort. however need to plan for connective filtered rain water reaching from surrounding area." Others would jokingly tell us that they'll help in arranging water tankers to fill the lake. - getting water outside the lake, for watering saplings, toilets, drinking. The water that falls from the sky into the lake would take ages to fill the lake, so getting rain water into the lake means that rain water from the neighbourhood will need to be diverted into the lake. It is a simple task where water from catchment areas will have to be channeled and fed to inlets of the lake, but it will require significant digging and alignment of the channels to the lake. About a year ago, with the help of Enzen, a survey of the lake and the surroundings was done to check the feasibility and establish the quantum of work. The findings were positive and they were presented to BBMP. It has taken a while, but we are happy that the BBMP was convinced that this would be a worthwhile investment and agreed to undertake this work in the very near future. Fingers crossed! Once we have more water in the lake, some of it can be used to solve the issue of water availability outside the lake. 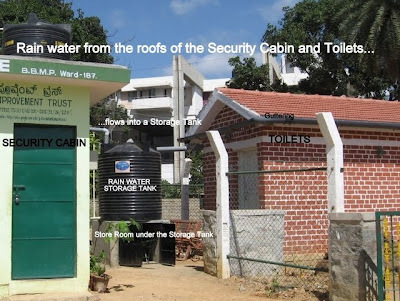 The shortage of water in recent times seems to have revived the ancient technology of Rain Water Harvesting (RWH) in urban India. 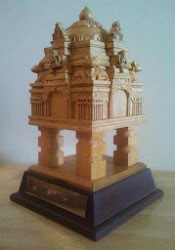 Many children who are learning about RWH think it is an innovation of modern day eco-saviours and are surprised to know that civilizations such as the Indus Valley, Greek, Roman had incorporated RWH in their architecture thousands of years ago. Common sense would have told our ancestors that places located away from a sea coast or the banks of a river needed to depend on the rain to meet water requirements, and given that it would not rain through the year, the water that did fall from the sky needed to be saved. The founders of Bangaore knew this too, and that is why Bangalore was once the City of Lakes (rain-fed lakes). Kanheri Caves, Borivali, Mumbai (1 BC to 10 AD) is a group of 109 caves that have been carved into a basaltic rock hill. Unlike what we expect monuments to be, the caves are not elaborately decorated and would have been a very functional Buddhist settlement. The most striking feature of the caves is the rain water collection mechanism and water storage cisterns, which would not only harvest rain water, but also keep the caves cool. Less ancient, the Agra Fort, in Agra (built in the 16th century AD) also has a very neatly laid out RWH system. 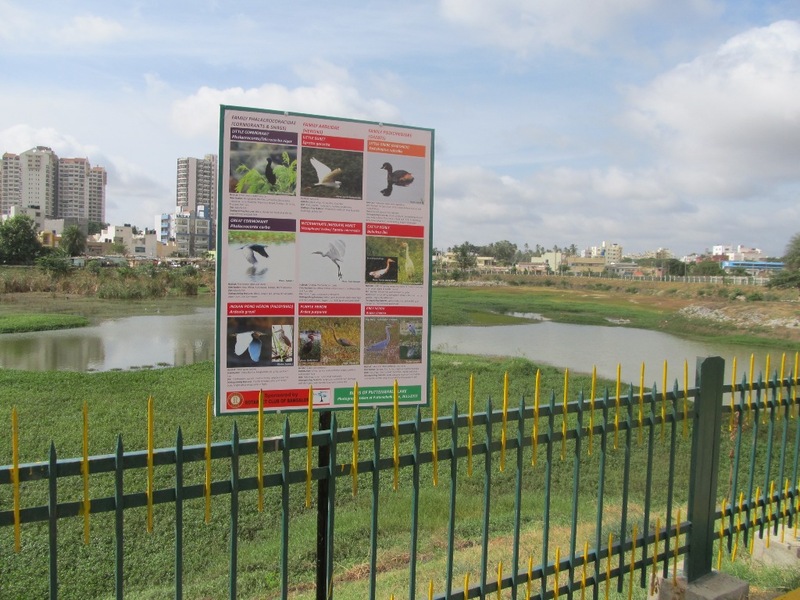 At Puttenahalli Lake too we have RWH, which will help meet the water needs outside the lake to a large extent. Implemented about a month ago by Refurb-India (thanks to Mr Shankar Rao of Refurb-India, who also subsidised the cost for us), the RWH system at the lake is set up to harvest the rain water that falls on the roofs of the three small buildings at the lake - the Security Cabin, the Toilets and the Gazebo. With a collective catchment area of approximately 530 sq ft (49 sq m), at efficiency of 90% (i.e. giving allowance for spill off), a moderate rainfall of 10 mm, will catch about 440 litres of water*. We have installed one 2000 litre storage tank between the Security Cabin and the Toilets, designed in a way that the space below the tank serves as a storage room for small tools. 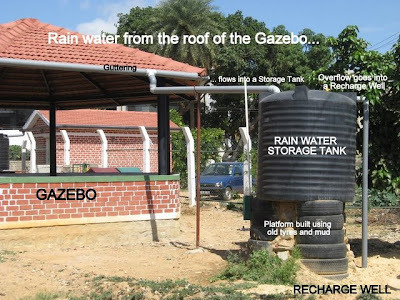 A second 2000 litre storage tank is fed by the Gazebo. 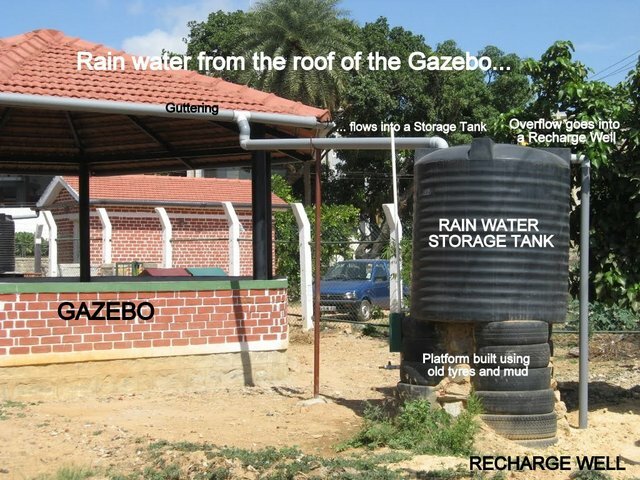 This tank was already set up (in March 2011) on a platform built using 21 discarded tyres and mud. Overflow from this tank is directed into a ground into a Recharge Well. We hope that apart from its functional utility, the RWH system at the lake will serve as a live model for the neighbourhood, where people from the locality can actually see how simple it is to save and reuse rain water. Now we just need the rains! * Rain Water Harvesting calculation thumb rule: A rainfall of 1 mm catches 1 litre of water for every 1 sq m (10.76 sf ft) of catchment area. The morning started early for some students of BGS NPS, Hulimavu on Saturday, 14th July 2012. Twenty seven children of Std VIII, accompanied by three teachers, attended a nature walk at Puttenahalli Lake. Bird watcher Jaishree Govind joined Usha, Nupur, Prasanna and Sapana to take the children on a guided walk that lasted for almost two hours (7:15 - 9:00 a.m.). The water level has reduced due to evaporation and the delayed monsoon but many more birds have shifted residence to our lake. A Grey Heron has joined the resident bird community and the Purple Herons have increased in number. The children were thrilled to see the Little and Great Cormorants fishing and drying their wings. Jaishree showed them a Sunbird. The excitement of the morning, however was the sighting of a Tailorbird, hitherto not spotted at the lake. A tiny thing, the Tailorbird makes up in speed of flight what it lacks in size. 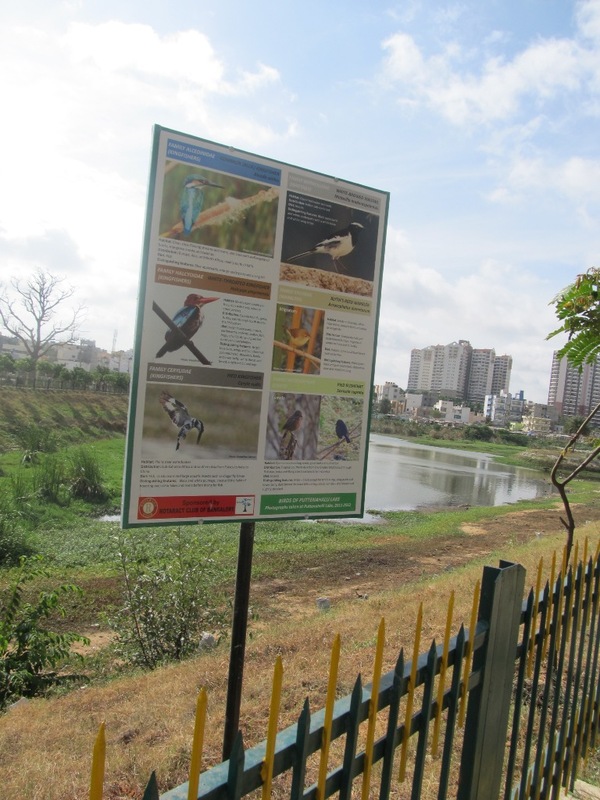 Veteran ornithologist Zafar Futehally says that the Tailorbird is a common bird which is finding it difficult to get insects because of the pesticides being used extensively. PNLIT Shutterbug Harish Mahendrakar who was at the lake to catch the early birds on his camera said, "Only saw the tailor bird... Could not click :( ." With the zeal of Salim Ali, the Father of Indian Bird Watchers, the children ticked off the names of the birds they had spotted in their copies of PNLIT's Sighting Booklet. The little booklet containing information about the lake and a list of the plants and birds at the lake was an invaluable souvenir for them to carry back home from their visit. Harish's pictures of the walk can be seen here. His pictures at Puttenahalli Lake, taken over the past few months can be seen here. For PNLIT-guided tours of Puttenahalli Lake, do get in touch puttenahalli.lake@gmail.com Cell 7259722996. After yesterday's rain, the lake this evening. Looking forward to a lot more showers! PNLIT Trustee, Prasanna says, "I was at the lake from 6:30 to 7:15 p.m., there was still light and it was a wonderful sight to see the white Egrets, Purple Swamphen, Moorhen, Heron, Purple Heron, all on the Island. The big fella Purple Heron tried to perch on the Singapore Cherry tree but the branch couldn't take its weight." PNLIT Trustee Usha Rajagopalan's new book has just been published! 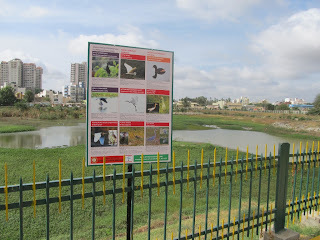 While it is not about Puttenahalli Lake, the lake does find mention! Selected Poems of Subramania Bharati, published by Hachette India (in its Everyman Classics series), includes fifty-two Tamil poems translated into English, and is Usha's fourth book. The painting on the cover is by the eminent Delhi based artist Mr A. Ramachandran, oil on canvas and part of his 2004 series called "Stream". Usha's other books are a writer's manual (Get Published, OUP, 2001), a novel (Amrita, Rupa & Co., 2004) and a collection of short fiction (Corpse Kesavan & Other Stories, HNM, 2008). It's now official. 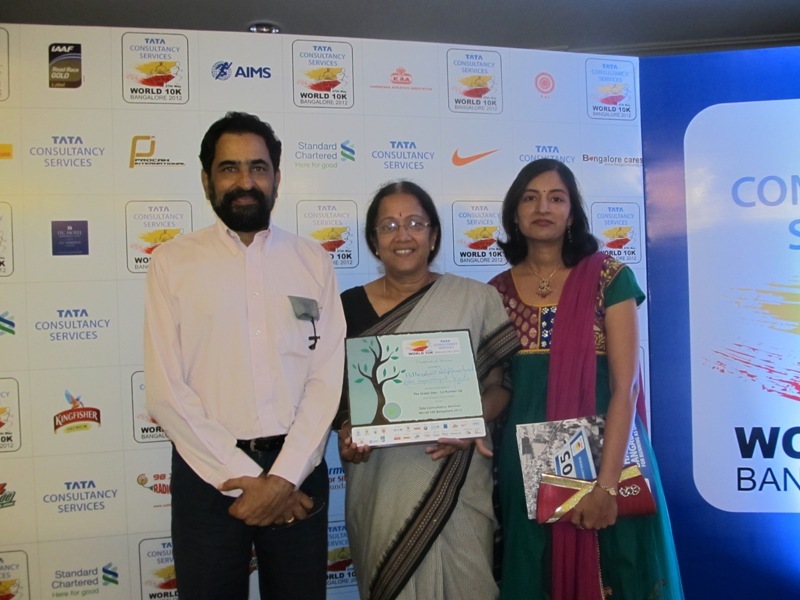 The TCS World 10K 2012 Bangalore raised about Rs 3.06 crores for 84 NGOs that were registered with Bangalore Cares, the official charity partner for the event. Releasing the charity docket on 11th July 2012, Mr Murray Culshaw of Bangalore Cares said that this international race has emerged as the best platform for NGOs in Bangalore to create awareness about their cause and to raise funds for their work. This was the first time that PNLIT participated in a fund raising event and we are happy that we could raise Rs 37,301/-. While some of the donations came through the PNLIT page on the Bangalore Cares website and through direct efforts, a significant amount of Rs 14,000/- was raised by 10K runner Abhijith Rao. Our sincere thanks to him, to all the donors and to the other 10K runners (Farhana Ritesh, Sanjeev Daithankar, Subramanyam Putrevu, K.P. Suresh, Jayaraman) and their friends who helped in creating awareness by wearing PNLIT bibs during the 10K run. We look forward to your support for future fund raisers too. During one of the NGO interaction events organised by Bangalore Cares, NGO reps were sharing experiences and ideas on getting people to donate towards their causes. When it was PNLIT's turn, despite the media exposure we have had, many people present had never heard of PNLIT. So some time was spent in talking about our trust, what we are doing, how we have been managing the lake with individual donations and the challenges we face in fund raising. Though we get a lot of appreciation for saving a water body and looking after it, when it comes to financial and physical support, our general experience has been that people are reluctant to give money or volunteer for a "still lifeless" government-owned lake and prefer healthcare, education, children, underprivileged, disabled. PNLIT had first hand experience of this - we got an overwhelming response for our Puttenahalli Government School Charity collection whereas other requests for donations to the lake went by with minor responses. (There have been exceptions though - which is why we've got the donations and volunteers that we have.) At present we manage with about Rs 20,000/- per month but to be comfortable without compromising requirements at the lake we need Rs 40,000 - 50,000 (Rs 5-6 lakhs per annum). We're trying to build a corpus and make the lake a self-sustaining replicable model through other activities. The Association for People with Disabilities (APD) has been a major 10K fund raiser and this year they raised a whopping Rs 72.17 lakhs! One of APDs top fund raisers, a dignified old man was listening to woes of inexperience. Apparently, he does not use the internet and all his fund raising is through postcards/ snail mail and face-to-face meetings. "How many houses do you have around the lake area? ", he asked. Doing a very rough calculation... Brigade Millennium - 500, South City - 1000, Brigade Gardenia - 1000, Pioneer Paradise - 300, Brigade Palm Springs - 1000, Sobha Tulip, Elita Promenade plus all the independent houses... "About 5000". He had comments and suggestions on his fingertips, including some listed below. - When you ask for donations, remember you are not asking for yourself, so don't feel embarrassed to ask. - Do a house to house, building to building campaign. Rs 100/- per house - This will get you your Rs 5 lakhs for the year. People spend so much on so many unnecessary things. 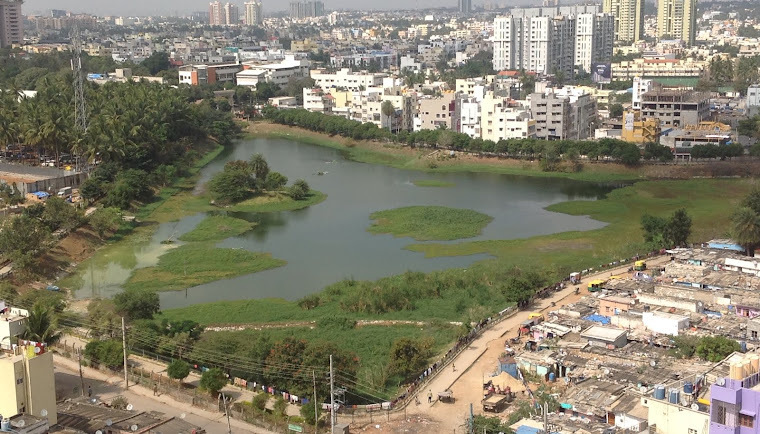 Rs 100/- once a year for a lake in their neighbourhood... it is a duty! - Get retired people and youngsters to help. - Get the locality RWAs to collect and contribute on behalf of the residents. - Let the donation collectors carry receipt books with them. - Don't be embarrassed to be a nag! Follow up with people who say they'll give later. Sometimes people genuinely intend to give but they truly forget. - If people say they have already donated to some other organisation, suggest that next time they can divide the amount with you. - Get people who work in offices to get their colleagues to donate. Some people earn Rs 10,000/- a day! They will surely give you Rs 100/-. You may even get Rs 1000/-. - Don't exclude the old pensioners. Retired people have limited needs and most will be proud to part with Rs 100/- for charity. - Get people who travel abroad to support you by getting their colleagues abroad to donate through them. A couple of dollars would make no difference there. - Don't wait for the 10K next year. You can fund raise through the year. All the advice of a very successful charity fund raiser recorded and saved, we look forward to your support to help us implement. We'll soon be knocking on the neighbourhood doors! We are delighted to tell you that PNLIT has been adjudged the Green Star 1st Runner-Up of the People's Green Award at the TCS World 10K Bangalore 2012! The winners were announced at a crowded press conference at ITC Windsor Manor last evening. Prasanna, Nupur and I received the award from Kannada actor Mr. Puneet Rajkumar and Mr. Atul Ballal of ITC Windsor Manor. 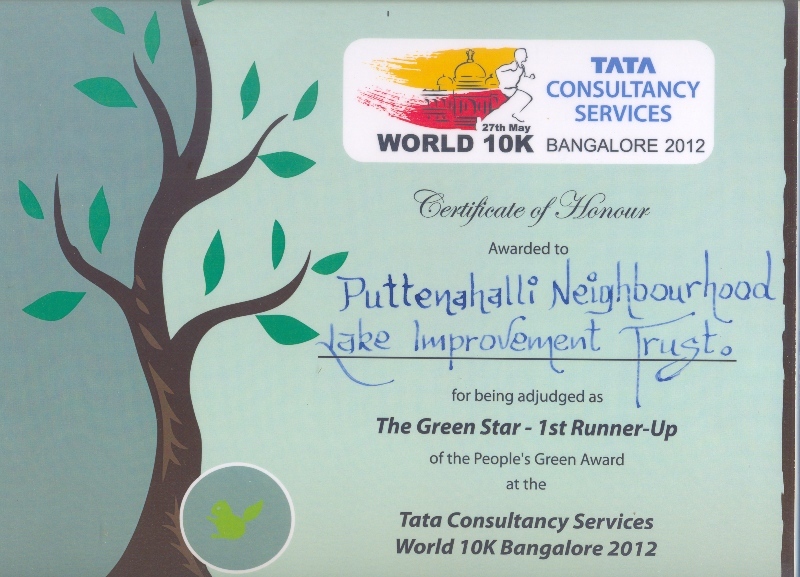 The TCS World 10K which was held on 27th May had launched the People's Green Awards as "a platform to admire and acknowledge people who share this dream to make earth greener and better place to live in." The nominations were in two categories 'Green Star' - Not for profit green initiatives by individuals, groups/ NGOs and 'Corporate Green Star' - for companies and corporate foundations taking green initiatives. See the press release here. Winners were selected on the basis of public voting (30% weightage) and the Jury (70%). The eminent Jury of the Peoples' Green Award which comprised Mr. Karan Bhalla (WWF-COO), Mr. Hem Pande (Joint Secretary, MOEF), Dr. Anil Kumar Dikshit (IIT Bombay), Prof Damodaran (Prof IIM - Bangalore) and Mr. Vivek B Singh (Joint Managing Director, Procam International) screened the final five to judge the winner. The 2nd Runner-Up prize of Rs. 25,000 went to MSI - Malleswaram Swabhimana Initiative, an RWA founded over a decade ago, has been working towards making Malleswaram a zero garbage locality by creating awareness about waste segregation at source. The Grand prize of Rs. 75,000 to Samarthanam's Parisara which aims to provide end-to-end waste management solutions for the corporate organizations. First Runner-Up prize of Rs.50,000 was awarded to PNLIT, our local citizens' initiative to restore and maintain Puttenahalli Lake with public participation. Though PNLIT is only two years old we have managed to save the lake and more importantly, become a model for other resident groups in the city. Our success would not have been possible without support from you, residents in the area. A big, big thanks to all of you. We look forward to your continued support. OPR, Arathi - we missed you so much!! This award is for you! 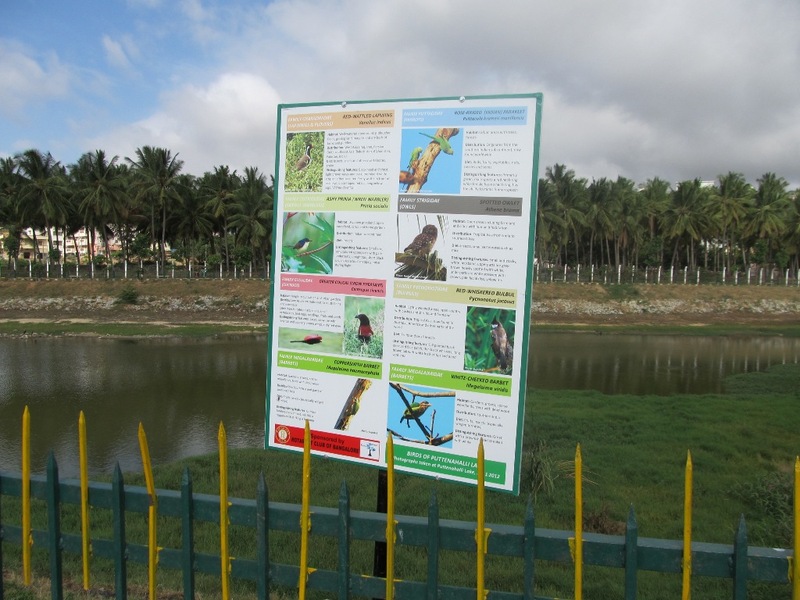 It has been our desire to make the visits to Puttenahalli Lake more meaningful for everyone. 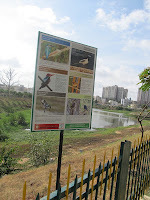 Towards this, those who have visited Puttenahalli Lake recently, would have noticed that they have the help of sighting boards to identify the birds that they spot. Over the past year, PNLIT Shutterbugs (enthusiastic individuals who keep visiting the lake to bird watch and photo-capture the birds), have been helping us identify the birds that frequent the lake and document their residency and visits. 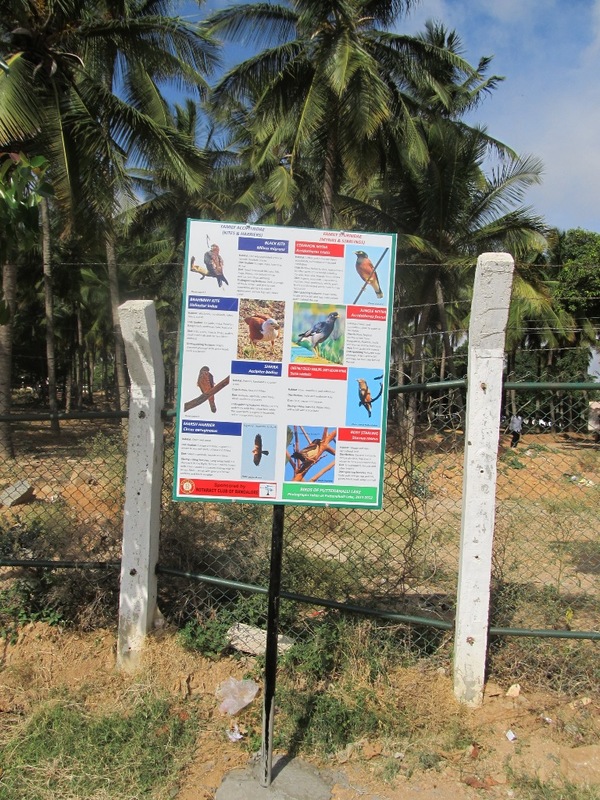 To date, we have spotted and positively identified more than 55 species of birds in the lake vicinity. 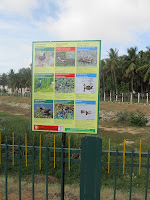 40 species, belonging to 21 bird families, have been featured on five sighting boards "Birds of Puttenahalli Lake", along with key information. We also have one large board at the entrance with information about Bangalore lakes. 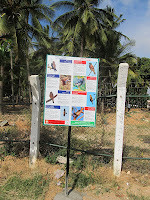 All the photos on the boards have been taken at Puttenahalli Lake by the Shutterbugs during the period 2011-12 and due credit has been given to each photo. Our thanks to Shutterbugs Deepa Mohan, Govind VT, Harish Mahendrakar, Hayath Mohammed, KamalHari Menon, Rajiv Ratnam, Ram Manoj, Rosita Sequeira, Sanjay Mysoremutt, Shubho Banerjee, Sudhir Singh, Sujesh S. and Sushil Katre whose photos we have used, and without which we would have had to rely on opensource pictures. Our grateful thanks to Rotaract members Chandini Vynatheya (who made a PNLIT presentation to Rotaract), Arihant Kumar, Shreyas Harithsa and Ankur Dubey (who took care of the logistics of getting the boards ready and setting them up) and to all the others at the Rotaract Club of Bangalore, the sponsor of these boards at Puttenahalli Lake. 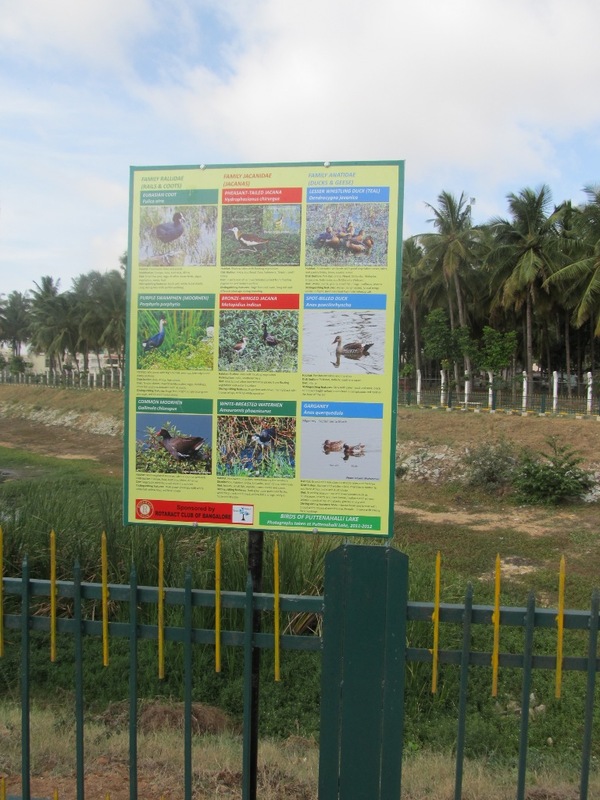 - include the resources of the city (natural and man-made) - including ponds, tanks and lakes, raja kaluves, forested areas, hills, parks, playgrounds. There may be a need for restoration and demolition of existing structures to achieve this. - include basic amenities - clean streets, walkable footpaths, pedestrian crossings, sheltered bus stops with good signage, decentralised garbage handling, unclogged storm water drains, well-maintained toilets, etc. - be equitable, giving every one (the pedestrian, the cyclist, the motorist, the trucker, the autorickshaw, the child, the teenager, the housewife, the differently abled, the senior citizen, the rich, the poor, etc.) equal access and right to amenities with no bias based on economic status, gender, etc. - incorporate people and the community as the centre around which the plan develops. - redefine land use so that public open spaces are restored. - focus on mass public transport and traffic-free ways rather than road widening and building flyovers. - Go road to road in a truck and with sufficient workers and equipment. Pick up all the rubble, garbage, fallen branches, debris, storm water drain filth and other unwanted material. Material should be immediately put into the truck and not left by the road. Check up what is wrong - broken footpaths, encroached area, open manholes, etc. Make a note and have it attended to in the next couple of days. - Appoint a neighbourhood watchdog in each area/ road to ensure that the place remains as such. Appoint a govt official to be incharge of each area. - Every ward needs an area where the pourkarmikas offload the waste they have collected. This is anyway being done but the waste is left on the roads to spread and be attacked by dogs. This needs to be formalised. Govt needs to identify the area where the waste will be offloaded and make a plan to build a proper covered shed there, protected from rain, dogs, etc. - All multi storied apts, office buildings, function halls, etc. should take care of their own waste within the premises. Chutes in mutli-storied apts for waste disposal are a barrier to segregation at source and need to be banned by the building plan sanctioning authorities. - Fix rules on how building construction/ renovation debris/ tree branches, etc. from individual houses, construction sites, etc. are to be disposed. They are strictly not to be dumped on the roads. - It is inevitable that there will be hawkers and roadside vendors in Bangalore city. These vendors block footpaths, occupy road space, throw their rubbish into storm water drains, use banned plastic bags - but we still want them. Many of them set up 'temporary' but permanent tents. A clear plan for roadside vendors needs to be made. Designate specific areas for them and be strict in allowing them only there. - Have push cart parking bays in certain areas. - Lay down rules for them - how their waste is to be disposed, etc. - We often have big shopping complexes on wide roads with no parking allowed either inside the building or on the road. Even the Passport Seva Kendra on Lalbagh Road that has a big compound does not allow vehicles to be parked inside. On many of the main roads, parking on the road needs to be allowed to facilitate optimal use of vehicles and to regulate pedestrian movement. - Purchase of new vehicles should not be allowed unless the buyer has a parking space for the vehicle. - Storm water drains should be protected and no one should be allowed to put sewage and garbage into them. This will prevent flooding during monsoons. - Implementation of RWH in new buildings should be clearly incorporated in the building plan. - In existing buildings RWH implementation should be strictly monitored. - Borewells have to be monitored. Underground water is a common resource but indiscriminately being commercially exploited by those who dig borewells. - Do the hydrants in the city work? - Roads that do not enable fire access need to be relooked at and open spaces created to enable access. - We need a comprehensive plan that incorporates all road users' needs rather than just enable cars to speed through cities. - Some clear guidelines, laws need to be established on road widening. Which roads will be widened, at what point is the road "wide enough"? What will be the width of the pavements? Where will there be pedestrian crossings? How will disabled people go from place to place? What about a bus-lane? How will non-motorized transport be encouraged? - Before deciding on flyovers and widening, we need to consider that flyovers and wide roads have not solved traffic problems anywhere. The only solution is mass transit. Beijing, Moscow, Bangkok all have invested more money in roads and expressways and flyovers than we can ever imagine. But they still have clogged roads (just google Moscow or Beijing traffic and see images). Bombay - flyovers were built on the Western Express Highway to supposedly make traffic move fast. But go in the evening and average speed falls to 10 kmph (a bit faster than walking and slower than cycling). - In Bangalore itself, we have spent crores of rupees on widening roads and building flyovers. Before any road widening and flyovers are in the plan, data needs to suggest that we have improved the situation for more than 2 years. Richmond Road has been widened by converting into a 4 lane one-way, but it is still clogged. Same for Residency Road and same for Seshadri Road and JC Road. BBMP needs to prove that road widening has improved average speeds through that stretch and over a sustained period of time and during peak hours. - If you take any road (JC Road being a prime example), out of the 4 lanes only 2 - 2.5 are usable. The left most lane will have puddles, slush, loose mud and illegally parked vehicles; not many two wheelers will use it. The right most has similar problems. This is because the drainage system allows sediment to accumulate. If the full road was made usable, then that itself would be one stage of widening. What is the plan for this? - What about pedestrian facilities? Take Sankey Road near the Palace grounds; pedestrians run across about 10 lanes of traffic risking life and limb. Same on Richmond Road or Residency Road or JC Road. Many people like to walk, but the present city does not allow it! - Where roads are widened e.g. Bellary Road, there need to be bus shelters, proper bus stops, etc. How will bus users benefit from the road widening if there are no shelters. - Given that the Metro is coming, there should not be anything in the plan that will structurally damage the city to encourage private transport. - Remove some of the one ways on streets and make them bi-directional again. This will enable bus stops conveniently placed for people to use.